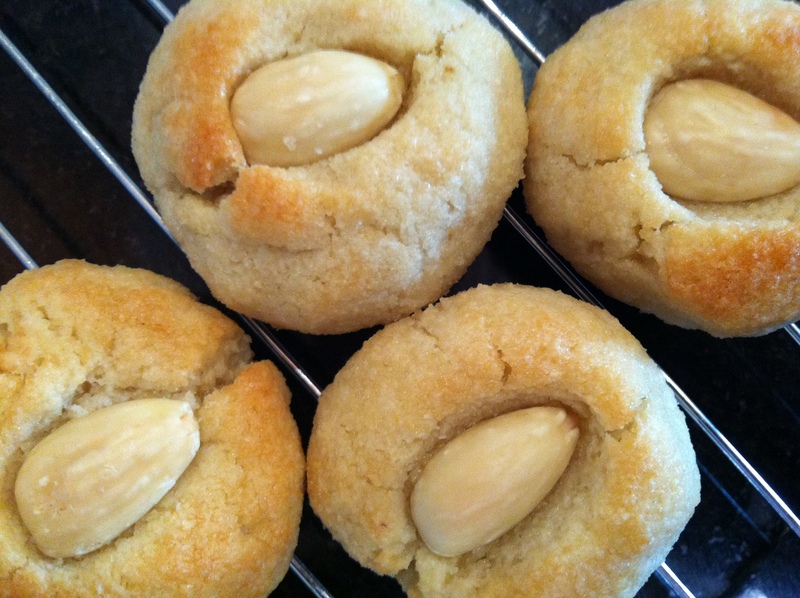 Some more baking going on Chez Moi: some delightful gluten free almond biscuits (for which I got the recipe from a friend, but I note they are very similar to a Nigella recipe from Feast). And, an semi-successful experiment where I tried to recreate those apple cakes you get from bakeries all around Australia, because Mr B loves them. (Semi-successful, because I tried to make lemon icing using castor sugar, and that was all kinds of fail). These are gluten free, and I made them for a team morning tea as our PA is unable to eat gluten. They are also, handily, ridiculously easy – stir all together, roll into balls, bake! Baked golden brown and devoured quickly. Preheat oven to 200 C (390 F). Combine ground almonds, sugar, egg whites (no need to beat), vanilla. Wet hands with rosewater and form small balls of mixture. This is to avoid the mixture sticking to your hands. Don’t use too much rosewater or they end up tasting like soap! You could also use water if preferred. 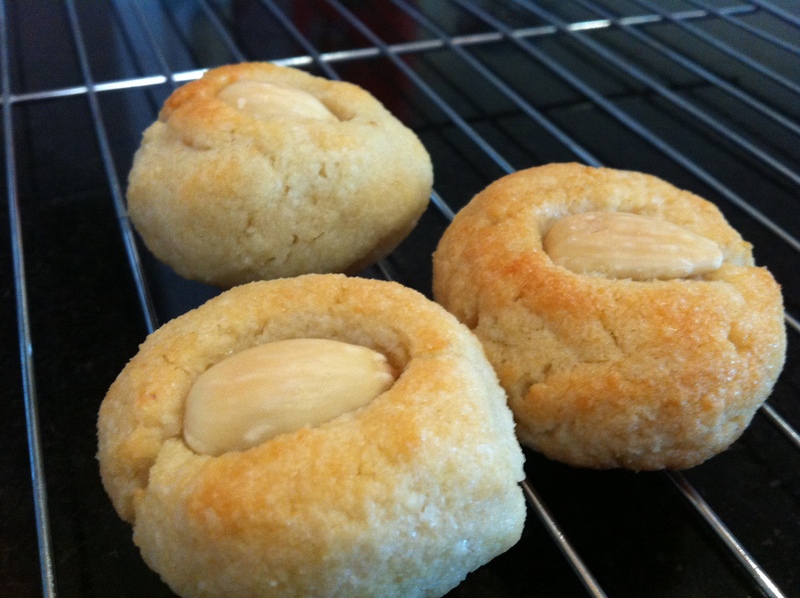 Press slightly and place on tray and place an almond on each. Bake 10 – 12 mins till light golden brown. It’s well-nigh impossible to find a recipe for Apple Cakes on the internet. Perhaps they are a uniquely Australian thing? I was looking and looking, and finally found this post on the Taste forum. Made them and they turned out nearly spot on! I note that in the post, there is one egg in the ingredients but the method talks about eggS plural – I went with one egg, and it seemed to work out fine. The recipe below makes six “bakery-sized” apple cakes, but you could make more smaller mini pies if you like. 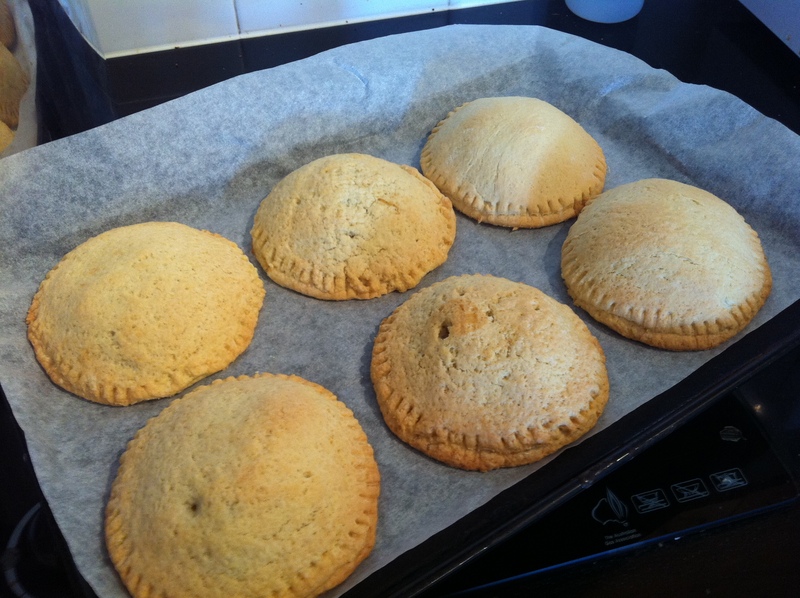 I think the ratio of apple to pastry was a little low – next time I would try to pack even more apple into the inside! Oh, and while we’re talking about that hard white icing that REAL apple cakes have – more experienced bakers than me would know that castor sugar is not a substitute for icing sugar – now I know as well. I made a dribbly gritty lemony mess. Come to think of it, why are they called cakes when they’re much more like pies? Preheat oven to 180 C. Sift flours into large bowl, rub butter into flour. Add sugar. Beat egg with fork, then add water. Add liquids to dry ingredients, mix to a firm dough. Using a quarter or half dough at a time, roll out and cut into rounds. Place a little apple on one round and fit another on top. Pinch edges together to seal. Bake for 25 mins in moderate oven. Tags: almond, almond biscuits, apple cakes, biscuits, cookies, gluten free, pies. Bookmark the permalink.